Imagine you could put your field service technicians into a virtual environment where they could hone their skills before actually taking on “live” maintenance tasks. What if the comprehensive knowledge accumulated by your organization could be made available for this kind of training and more? And consider the benefits of technicians being able to locate an element in need of maintenance quickly and easily, then carrying out the repair safely in even the most demanding environments. 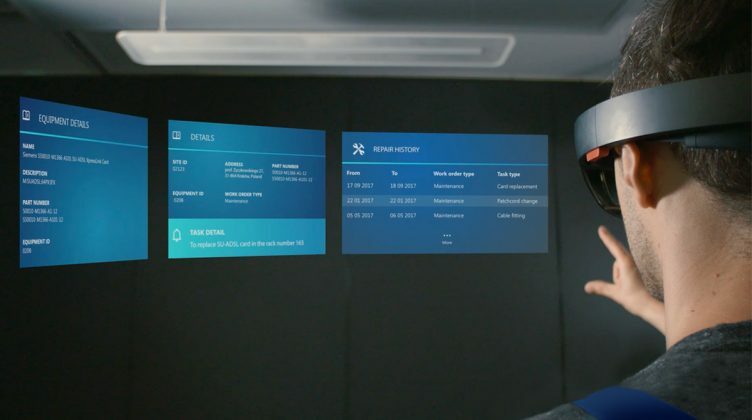 With a dedicated mixed reality app for Microsoft HoloLens, your field service organization may benefit from all these possibilities and give you an edge in a rapidly changing market place. Developing an app for Microsoft HoloLens headset for field service management requires in-depth analysis of technicians’ daily responsibilities, the obstacles they have to overcome every day, and of course the potential of this device. For instance, Microsoft HoloLens uses sensors to scan the real world and create a 3D map of the environment, into which digital elements can be placed, manipulated and moved as if they were really there. It goes a step further, too, with six degrees of freedom (6DOF) positional tracking that lets users shift their viewpoint and move physically in the virtual space. With the mixed reality (MR) app for HoloLens, your engineers can scan the area around them when they arrive – using QR codes on parts to rapidly identify a given element in need of replacement or repair. Because Microsoft HoloLens is a head-mounted device, it opens up the potential for hands-free work. For example, an MR app taps into this potential on several levels, allowing technicians to access customer details, equipment information and repair history using voice commands and hand gestures to navigate data presented in hologram form. For engineers in remote or dangerous locations this functionality is especially useful, because they can resolve issues without having to hold onto physical mobile devices. You might take care to recruit only the very best new field service technicians, but there will always be a need for training so that they can enhance their skills in terms of the specific needs of your organization and your clients. Here, a mixed reality app plays its part too. It facilitates “learning by doing” – extending this out of the physical classroom and workshop into a virtual environment that gives your new field service team members hands-on experience before they ever enter a client’s premises. Furthermore, the mixed reality app in combination with the HoloLens device facilitates ongoing training and skill development – which are vital at a time when technologies are changing faster than ever and technicians are required to keep pace. The knowledge and experience of your field service technicians are valuable assets for your organization. The mixed reality app for HoloLens lets those with more experience share their skills, even guiding new colleagues through specific routines using shared holograms. But knowledge management doesn’t have to stop there. The app acts as an instant gateway to information about the resolution of the most common issues, with manuals available in 2D video and 3D hologram format. Thus, maintenance work proceeds more rapidly, as there is no need for a technician to refer repeatedly to back office staff or colleagues for guidance. With so many possible applications of mixed reality app, and so many advantages inherent in this solution, now is the moment to ask yourself – shouldn’t your company develop its own app for Microsoft HoloLens too? Before you answer this question, imagine you are able to send better trained, more highly skilled technicians into the field to carry out maintenance and repairs more rapidly and precisely, whatever the environment in which they find themselves. And then consider the direct impact it has on customer experience and satisfaction, boosting your organization’s overall business performance in an increasingly competitive market. If you decide to implement this solution, you can take advantage of others’ experience, for example drawing on the Comarch FSM app for Microsoft HoloLens.